O'BRIEN: Very--their most sacred land. GAFFIGAN: --and, out of respect, we carved four white guys into a mountain. "This land is sacred." "Yeah, yeah, yeah, yeah, we'll be done here in a second. These fellas were all about freedom. Especially the two guys that owned slaves." How Many White Comedians Does It Take to Make Some Indians Happy? By Gyasi RossHis joke happened to mention Indians. Shortly thereafter, I see 10 posts on Facebook that Jim Gaffigan is talking about Indians. So what? Indians talk about Indians all the time. Here at Indian Country Today Media Network, we talk “Indians.” A lot. Too much, sometimes; I occasionally want to hear about Mongolians (I hear they have goot beef) or the French (I hear they have good toast and fries). Indianz.com talks about Natives. I hear that Beyond Buckskin (beyondbuckskin.blogspot.com), Native Appropriations (nativeappropriations.blogspot.com), Ruth Hopkins, Chuck Trimble, Randi Rourke, Native America Calling, etc., all talk about Natives. A lot. We are fortunate enough to have all these networks that discuss our Native people in detail, and still some Natives get excited when a white comedian makes one joke about Indians? Do we really value white people’s opinions about Natives that much more than our own people’s opinions? Are we really that attention-starved—we get happy whenever we get a moment’s attention from famous white folks? I don’t see those types of celebratory tweets and facebook messages when Ruth Hopkins writes something about Indians, and her articles are freakin brilliant! The quest for approval and validation is profound indeed.Comment: I agree with Ross. When I hear a group to which I belong mentioned--nerds, science-fiction fans, comic-book readers--I don't think, "Wow, that's great." I'm much more likely to think, "Wow, they got us wrong. Again." And even if they get it right, it's not a big deal. When NASA named the shuttle after Star Trek's Enterprise, and the actors appeared to christen it, that's a big deal. A mere mention is nothing compared to something like that. For more on Mt. Rushmore, see 40th Anniversary of Mt. 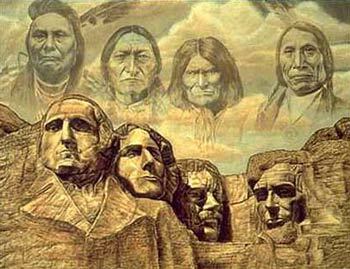 Rushmore Occupation and Reactions to Natives at Mt. Rushmore.